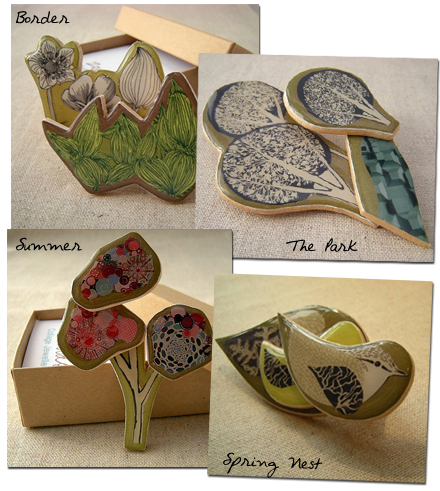 I spotted these collaged brooches on All Things Original - Zoe uses images from papers she finds via, car boot sales (yard/garage sales), skips and used gift wrapping paper. Each one is finished with a glossy sealer. These would make really unique wall decorations or you could sit them on top of a shelf! You could also find these and other lovelies by Zoe in her etsy shop zoeest.etsy.com. ACK! I am in love! No kidding, these would be beautiful wall decorations! I love, love them! What an incredibly unique idea! They are wonderful. I came here via Chakra Pennywhistle - we're trying to spread the word about a new arts and crafts charity project, and it would be great it you would have a look and consider adding a link or posting something? I'm logged in as made4aid, which will take you to the charity auction blog. and there is a more personal introduction to the project at my own blog. How very clever and attractive.